A composite based core material designed for the easy fabrication of core build-ups. The core material is a dual cure, fluoride releasing resin core material. 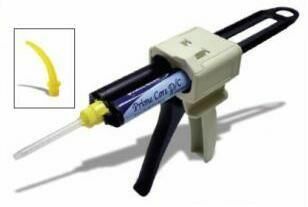 Dispensed with an applicator gun and auto mixed in mixing cannulas providing a consistent, homogeneous mix. Intra oral application tips are provided for precise, direct placement of core material. Available in a contrast blue shade which is easily distinguishable from tooth structure and natural - A2 shade for optimum results beneath ceramic crowns. The core material releases fluoride to help reduce secondary caries. Dual curing and quick setting eliminating time consuming layering of material and allowing for easy bulk fill.